The Lord’s Prayer is the most recited, most memorized, and most studied text in the Bible. This prayer of Jesus, found in two versions in Matthew and Luke, has been extolled for its simplicity and beauty, for its reflection of “real life,” and for its vision of the consummated kingdom. It also contains several conundrums: what does it mean to “hallow” the Father’s name? What relationship does our forgiveness of others have with God’s forgiveness for us? If God does not tempt, why would we pray “Lead us not into temptation”? This commentary not only addresses these important questions but also offers insight into how the global church throughout generations has interacted with the Lord’s Prayer and has found in it inspiration and hope. Nijay K. Gupta serves as Associate Professor of New Testament at Portland Seminary of George Fox University. He is the author of four books including Colossians in the Smyth & Helwys Bible Commentary series (2013) and 1–2 Thessalonians (Wipf & Stock, 2016). He has published several academic articles for leading biblical journals such as The Catholic Biblical Quarterly, Journal for the Study of the New Testament, and Neotestamentica. In 2016, he co-edited (with Kristian Bendoraitis) Matthew and Mark across Perspectives (Bloomsbury). What a delight to have such a thoughtful and stimulating commentary dedicated to the Lord’s Prayer! Gupta’s depth of research and clear prose will serve readers for years to come. Nijay Gupta has written a volume about the Lord’s Prayer that offers a rare combination of solid exegesis with pastoral warmth. Gupta makes the prayer of all prayers come alive with careful exposition combined with insights from literature, history, and art. A truly judicious investigation of the theological dimensions and spiritual depth of the Lord’s prayer. Resonating with the rich heritage of prayer, Nijay Gupta’s commentary brings new light and vitality to reading Jesus’ most well-known prayer. Gupta’s approach combines practical wisdom gleaned from the Lord’s Prayer with intellectual depth and spiritual expression. In doing so, he has created a resource that will be meaningful for all kinds of readers! Nijay Gupta has crafted a lovely volume on the Lord’s Prayer. He illumines this well-known prayer with attention to its back and front stories. Readers will appreciate Gupta’s clear exposition of the prayer in its Matthean and Lukan contexts, as well as rich contributions from its reception history—in word and image. This is a gem of a commentary. This is a commentary with texture! It is multi-grained bread for a bleached-bread world. Gupta deftly immerses the reader into the historical, exegetical, and theological riches of the Lord’s Prayer in a way that accentuates its relevance for every cultural context. The clarity and depth of the commentary sections alone are of surpassing insight and quality. But to these are added an expansive resource of sidebars and visuals that serve to capture the imagination of the interpreter and give freshness for sermon preparation. Professor Gupta’s work on the Lord’s Prayer is a must-read for scholars, pastors, and all who desire to plumb the depths of its meaning. Highly recommended! How many of us have been taught to recite the “Our Father” or “The Lord’s Prayer” but never really reflect deeply on it? Nijay Gupta has not only offered all of us a comprehensive commentary on this famous prayer, but also teaches us about the practice of prayer itself. Gupta’s engaging work will educate as well as stimulate, as readers will come away with greater insight regarding the prayer as it appears in the Gospels of Matthew and Luke. Individuals, as well as groups, will find Gupta’s commentary a useful tool in their study of Scripture. I find it ironic that many Christians, myself included, have no recollection of ever memorizing the Lord’s Prayer. It seems as if it was just there, on our tongues, when we needed to pray it. At the height of Holy Communion, the Book of Common Prayer invites us weekly to pray together as the Lord taught us: “And now as our Savior Christ taught us to pray, we are bold to say.” The Lord’s Prayer is the gospel in prayer form. This recognition of the Prayer’s familiarity speaks to its importance, but also to its neglect; so as the saying goes: familiarity breeds contempt. Nijay Gupta’s commentary on the Lord’s Prayer attends to both realities by unpacking the prayer’s power through a thorough exposition of its petitions and by reasserting its importance for a Christian spirituality that is shaped by Jesus. Nijay’s commentary is well-researched and accessible and rich in theological insight. Nijay presents the Lord’s Prayer as an indispensable model for a Christian’s prayer life and as vital for Christian spiritual formation. 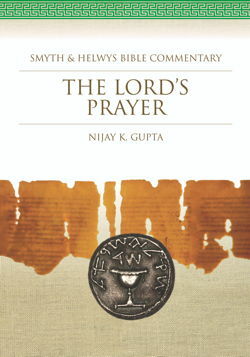 Nijay Gupta’s fine book brings together the best of scholarly study of the Lord’s Prayer in Luke and Matthew, a wide range of responses to the prayer from the Christian centuries, stunning visuals to illustrate points, and thoughtful reflection on the prayer’s implications for Christian living and praying today. It illuminates the prayer beautifully by engaging phrase by phrase from this wide range of angles. It is said that to communicate clearly, you must understand profoundly: this excellent study of the Lord’s Prayer accomplishes exactly that difficult art. Nijay Gupta has put thoughtful Christian people, as well as students, pastors, and professors, in his debt by his deep research and his clear and lucid writing. His book deserves a wide readership.